Slide guitarist Brian Jones placed an advert in “Jazz News” inviting musicians to join a new R&B adventure that he was thinking about. Stu Stewart ( raised in Sutton, Surrey) was the first to respond to the advert. After Stu Stewart’s appointment, the Dartford (Kent) lad Mick Jagger also replied to the advert. Mick brought along school-chum Keith Richards to the first audition. 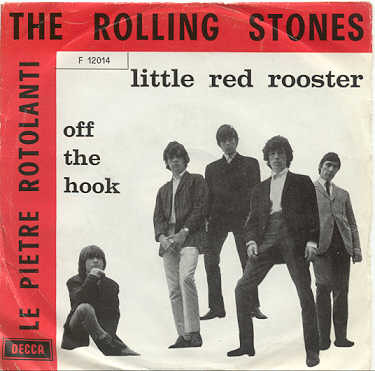 In 1964, Decca Records released The Rolling Stones’ hit Little Red Rooster. Written by Willie Dixon the song was recorded by Howlin’ Wolf in 1961. Willie Dixon himself played bass on that recording. The Stones recorded their version of the song at Chess Studios in Chicago, the same studios where Howlin’ Wolf and Muddy Waters also regularly recorded. It was the Stones’ last cover song.